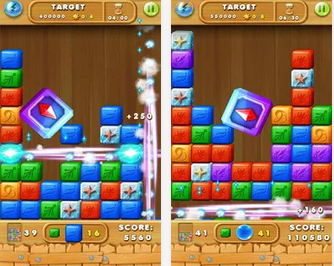 Clear squares and bring down the heart square to level up! Try to make star cubes touch. When they touch they merge together, which increases their value. Make the Heart Square touch as many star cubes as you can to earn extra moves. You will gain bonus points and extra moves for winning stars. 4 same squares in a row produce blasts. Rows left, big square falls, rows rise. Clearing squares awards you with crystals, Crystals collected all together, a crystal ball forms. The crystal ball clears squares of 3x3 matrix, combines and upgrades stars in the region. You should turn off your wifi/3G/4G internet connection before you launch the Cube Adventure game. In-case you already open the Cube Adventure game, just force close or press your multitask button and swipe it out.